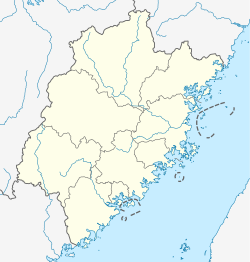 Pingtan County (Chinese: 平潭县) is a county comprising 126 islands in the Taiwan Strait, under the administration of Fuzhou, the capital of Fujian province, People's Republic of China. Now it is also the subject of newly founded Pingtan Comprehensive Pilot Zone (平潭综合实验区). The main island is Haitan Island (海坛岛; Hāi-tàng Dō). The county executive, legislature and judiciary is in Tancheng Town (潭城镇), colloquially called Pingtan, together with the CPC and PSB branches. The county administers 7 towns and 8 townships, accounting for 200 neighbourhood and village committees. Pingtan County has a total land area of 371 square kilometres (143 sq mi), comprising 126 islands, and covers 6,064 square kilometres (2,341 sq mi) of sea. The main island, Haitan Island, covers an area of 267 square kilometres (103 sq mi), or 72% of the county's land area, and is the largest island in all of Fujian. To the east is the Taiwan Strait, and is the closest place in mainland China to Taiwan. Pingtan, by virtue of its maritime location, has a moderated climate, with high humidity and minimal diurnal temperature variation. Under the Köppen climate classification, it has a humid subtropical climate (Cfa), with mild winters and hot, humid summers, though much cooler than inland places. The monthly daily average temperature ranges from 11.5 °C (52.7 °F) in February to 28.1 °C (82.6 °F) in July. The bulk of the rainfall annually occurs in spring and early summer, while autumn and early winter is the driest time of the year. The area experiences windy weather, with an average wind speed of 17.3 kilometres per hour (10.7 mph), and wind directions are consistent. Freezing temperatures have never been recorded here. ^ a b c 平潭 - 气象数据-中国天气网 (in Chinese). Weather China. Retrieved 2011-12-21. This page was last edited on 8 January 2019, at 00:47 (UTC).